Last night was Barolo night at the Maltings Cafe http://www.maltingscafe.co.uk/ run by Sam Harris, Fraser and I met up with a whole collection (what is the collective adjective for wine merchants?) of guys from the trade to taste a selection of Barolo 1971’s (& 3 Barbarescos) the tasting was hosted and organised by Eric Sabourin. For me as a Barolo fan this has been looming large in the diary for quite some time! 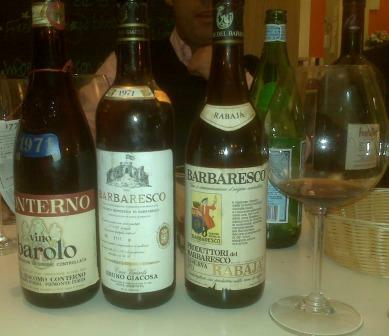 1971 is a great year for Barolo, up there with 1964, 1989 & 2004 at the very top of the tree. The format was 6 pairs of wines with just some bread to keep the plate honest. We were asked to score out of 100 so I have included these below, I found scoring them difficult in because it feels strange to score wines of this age when you know that different bottles will show differently. One observation from the moment I arrived was that the labeling (this is borderline geeky) is superb on these wines, varied but superb, you get a real sense of something special, far nicer than the dull minimalist so often found now. Whilst on the subject of labels what about the bottles….it appears there is no rhyme or reason to which bottle shape producers use and some producers, Giacomo Conterno for instance, uses the classic Albeisa (like Burgundy) bottle for Barbera and Cascina Franca and an almost Bordeaux bottle for Monfortino. This can be further confused by the fact that back when these wines were bottled it would not have been that uncommon for producers to go to their neighbours for bottles or vintage labels if they ran out, so you may find the “same” wine in two different bottle shapes…wonderfully Italian!! All the wines were decanted at 5.30 and put back into bottles then tasted from 7.30 onwards, this is certainly the best option despite the fact that some wines might have faded as this allows you to check the wines and give them a chance to show best. Barbaresco Rabaja Riserva – Prunotto (Pictured), nicely degraded nose, good now, savoury, nice start if not earthmoving (90). Barbaresco – Giovanni Moresco, Moresco used to only make one wine, a blend of vineyards but has now sold to Gaja (you may see the names on the odd Gaja label), good wine, fully brown but with good acidity, impressive (94). Barolo Marcenasco – Renato Ratti, a strange stink of degraded fruit, not sure it is a nose I like, palate big smokey and cigar box like, the 1978 is supposed to be better. Not for me but decent enough (87). Barolo Riserva – Franco Fiorina, a soy-like nose, very dry palate that would be good with food but a touch hollow without, solid (89). Barolo Brunate Riserva Speciale – Marcarini, a dash of Sercial Madeira about the nose but not a bad bottle at all, quite the opposite, this divided the tasters, I loved the tangy acidity (94). This backs up a bottle of 1970 I had last year, good value producer. Barolo – Bartolo Mascarello, simply gorgeous, drinking perfectly, elegant and balanced, a “Volnay” of a Barolo, this wine is always a blend of many different vineyards in different villages in this case it sings (95). Keep an eye out for “anti” Berlusconi labels from the early 90’s, Mr Mascarello being a staunch Communist! Barolo Bussia Riserva – Aldo Conterno, not a great bottle, a touch milky and a little too much tobacco for me, a shame (not scored). Barolo Rocche – Brovia, almost strawberry fruit, blind I would have ben in the 90’s!! Hints of toffee apple, unique in the tasting and remarkable if hard to rationalise as a 1971 (92+?). Barolo Cappellano, I wrote “I like this, I really like this”, great balance, very complete (93). Barolo Briacca Rocche – Vietti, almost perfect, gorgeously big with great balance, deliciously savoury, dense colour too (98). Barolo – Giacomo Conterno, richer, more textured and structured than any of the others. The one wine that almost needed more time. A note of Bovril. Seriously good (97). A memorable night with names to follow for the future, especially for me G.Conterno, Vietti, Bartolo Mascarello & Cappellano……Cheers Eric. Previous Previous post: Clos de Tart 2008….